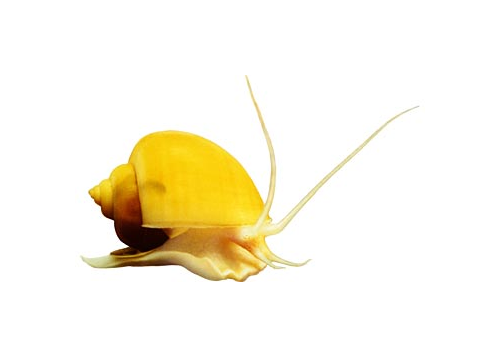 Good-sized freshwater gastropod, peaceful and quiet. There are different varieties of color (like the famous gold and purple) and hybrids, as well as closely related species are difficult to distinguish, but all to keep in a similar way. It's not picky, but the water must be well filtered and the plants should not be particularly sensitive. The aquarium must be equipped with a cover, since it can easily escape from an open tank. They can be raised also in a paludarium or in a ground-water aquarium, given that it can breath, since it requires air to breathe. It feeds on pieces of vegetables, fish food and algae. It also feeds on leftovers (if raised with other animals) and any bodies can be a useful "dust cleaner" in the aquarium. It does not disturb other tank mates, but may eat eggs and should not be combined with animal aggressive or much larger, which could also seriously damage the delicate tentacles. Reproduction involves the deposition of a large cluster of eggs, with its characteristic pink color and calcium carbonate rich shell. Hatching occurs spontaneously after a few weeks if the humidity is high enough, and small snails feed on newborn and behave like adults.